The tragedy of Hungarian Jewry occurred after the March 1944 occupation of the country. This does not imply that antisemitism was non-existent in Hungary before this date. It was an integral part of political and intellectual life in the inter-war period, and it especially increased from the end of the 1930s. In this period, following Nazi Germany but on its own initiative and without pressure from outside, the Hungarian parliament passed a series of discriminatory, antisemitic acts. The antisemitism of the Hungarian authorities claimed lives too: in 1941 thousands of Jews who were declared to have an "unsettled citizenship" were deported by the internal authorities; in 1942 in Újvidék hundreds of Jewish civilians were massacred by gendarmes and soldiers; while in the East tens of thousands of unarmed Jewish labour servicemen sent to the Eastern front died. Antisemitism was widespread among the civilian population, too. invasion. Dr M. H. L. experienced difficulties entering the University of Pécs due to the Numerus Clausus Act. "I experienced many unpleasant moments at the university, beatings and similar things." According to H. S. of Ketergény: "the peasants there were not decent with us. In 1939 when we rejoined Hungary, they were so evil they took away my husband." Nagykapos became part of Hungary again following the 1938 First Vienna Award. 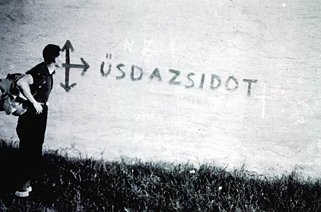 "When the Hungarians entered in 1938, antisemitism began. They broke windows, molested Jews, it was not possible to move around with a beard in our own town." P. Sz. was born in 1929. "From as early as I can recall, they didn't like Jews. I was beaten in the street in my school days because of my Jewish origin, it was like this from first grade." "In Kispest, even before the German invasion, antisemitism was very strong. They banned Jews from everywhere, they would not allow them to get work. 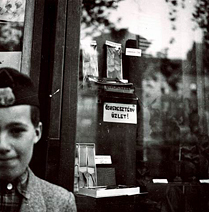 They didn't go shopping in Jewish shops, while on the Christian shops, they used to write: ‘Christian Hungarian shop.' ‘The Jew is the murderer of the Hungarian race!'" recalled E. G. after the war. According to another survivor, S. F., the population in the Máramarossziget area "was very antisemitic". In Szerednye, "there was fierce antisemitism, people broke windows, if they noticed a Jew with a beard they physically insulted him and made the life of all of us difficult". M. P. recalled similar tension in Szatmárnémeti: "a great number of Arrow Cross people lived here, and there was intense antisemitism ... People hated Jews very much". The writing reads: "Ancient Christian [i.e., non-Jewish] shop"
professions to 20 percent and maximized their number to this amount also at commercial, financial and industrial companies having more than ten intellectual employees. The second Anti-Jewish Law (1939), which defined the term "Jewish" predominantly on racial grounds, restricted their number to 6 percent in intellectual professions, banned them from the state administrative and judicial authorities and high-school teacher staffs. Jews were excluded from industrial and commercial professions that required a license, and their existing licenses had to be gradually revoked. As a consequence of the two Anti-Jewish Laws, over 90,000 people lost their livelihoods nationwide; including affected family members this represents around 220,000 persons. One of those affected was W.E. whose father, a farm manager, was dismissed from his job, and F. F. who lost the family farm. The business licenses of dry-goods merchant Sándor Amster in Budapest and timber-merchant Pál Neudorfer were revoked. Physician Benedict János was dismissed from Clinic II for Internal Medicine in Budapest. L. I. from Abony could not even get a diploma; under the terms of the Numerus Clausus Act he was barred from attending a university. His fate was shared by S. M. from Budapest, who, instead of pursuing a legal profession, became a gardener. W. J's sibling and mother were also dismissed from their jobs, thus the maintenance of the family was completely on his shoulders. When he was called up for labour service, the family remained penniless. People were incited against Jews all the time. the re-annexed territories as well. S. S. from Repede in Carpatho-Ruthenia recalls this as follows: "after the Hungarians came in, they took everything". S. E. from Rimaszécs (Upper Provinces) had similar experiences: "After the Hungarians returned, they revoked everyone's business license in 1938 and made life extremely difficult". The existential blows were easier to ward off for those who had some savings or had other sources of income. Zoltán Káldor was also dismissed from his job: "I went through hard times, as I could not find a job and lived on my savings". "We used up our savings." remembered Mrs Ervin Szőke about this period. The hotel of the well-to-do Kornfeld-family from Técső was taken away in 1940. They still had their restaurant, although "Hungarian officers were constantly coming in, demanded beverages, made us cook for them, but of course never paid a penny". Later the restaurant was also confiscated by the authorities, but they still had their piece of real estate they lent. The majority was not this lucky, though. The fate of B. Z. was much more common. In his testimony he burst out: "My life was driven by three words: poverty, poverty, poverty". severe enough, and they treated Jews even more radically than what the laws required. The leading figure of this illegal antisemitism was Sub-prefect of Pest-Pilis-Solt-Kiskun County László Endre , who after the German occupation organised the deportation of the countryside Jews as State Secretary of the Ministry of the Interior. The sub-prefect took some measures (e.g., banning Jews from the beaches and spas, excluding the Jewish vendors from the fairs) that were eliminated by his superior, the Minister of the Interior. The active antisemitism of the authorities was not necessarily satisfied with administrative measures. S. E., whose village was returned to Hungary after the break-up of Czechoslovakia, remembers as follows: "With the arrival of the Hungarians in 1939 anti-Jewish measures started with the revocation of business licenses, which was carried out by the gendarmerie, using harsh measures. They beat us, and the residents of the village enjoyed the spectacle." G. H., a seamstress from Ilosva, gave a similar testimony: "The gendarmes returned often and threatened my father to report him and we could carry on only by working for them free of charge." According to the testimony of S. K. from Ungvár: "Even before the German occupation, gendarmes caused lots of trouble to the Jews. They summoned them without any reason with various pretexts. They searched for immigrant Slovak Jews, and would beat everybody up." In the Carpatho-Ruthenian village of Várpalánka the soldiers "broke into some Jewish homes. They went to Munkács every evening and they broke into Jewish houses under the pretext that those were military exercises. They robbed the Jews of every possession and beat them to a pulp. They came back to Palánka at 12 o'clock at night and continued with us. Terrible noises, screams could be heard in the night. We lived through terrible times, trembling in horrible fear; that was the time when I got a heart ailment. The army terrorized the inhabitants all the time and beat Jewish men horribly without any reason." But all this was just a prelude to the atrocities of 1944 and 1945. Statistics by the Office of Protectors of Hungarian Israelites. 1942. Published by Don 1997, p. 59. On illegal antisemitism and the activity of Sub-prefect László Endre, see Kádár - Vági 2005, pp. 64-73. Yehuda Don: Economic Implications of the Anti-Jewish Legislation in Hungary. In David Cesarini (szerk. ): Genocide and Rescue. The Holocaust in Hungary 1944. Oxford-New York, 1997, Berg. 47-76. o.
Kádár Gábor - Vági Zoltán: Hullarablás. A magyar zsidók gazdasági megsemmisítése. (Robbing the Dead. The Economic Annihilation of the Hungarian Jews.) Budapest, Jaffa-HAE, 2005.